Promotional RB-Revo Blues Brothers Style Sunglasses are presented with Black frames and Blue or Purple lenses. These custom classic sunglasses are featuring UV400 protection and they also consist of Chrome accent jewels on front of the Black frame. Colored Revo lenses and 1-1/2" W x 1/4" H imprint space in the temple are also special features of these custom new arrival sunglasses. Order these products right now to get free online proofs, free design and lowest price guarantee offers. 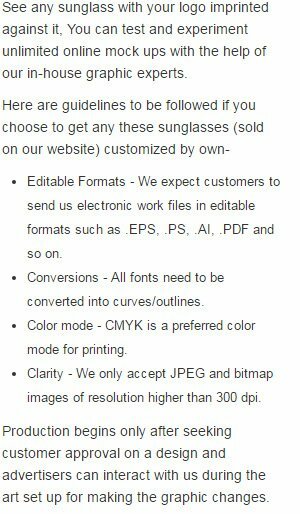 Request a quote to know what you can save on ordering Promotional RB-Revo Blues Brothers Style Sunglasses. Additional Information: Black frame with Chrome accent jewels on the front, Colored Revo lenses, UV400 Protection.